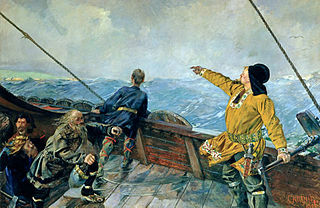 Gudrid Thorbjarnardóttir was a Norse explorer, born at Laugarbrekka in Snæfellsnes, Iceland. 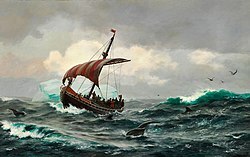 Eiríks saga rauða or the Saga of Erik the Red is a saga, thought to have been composed before 1265, on the Norse exploration of North-America. Despite the name, the saga mainly chronicles the life and expedition of Thorfinn Karlsefni and his wife Gudrid, characters also seen in the Greenland saga. The saga also details the events that led to Erik the Red's banishment to Greenland and Leif Ericson's preaching of Christianity as well as his discovery of Vinland after his longship was blown off course. 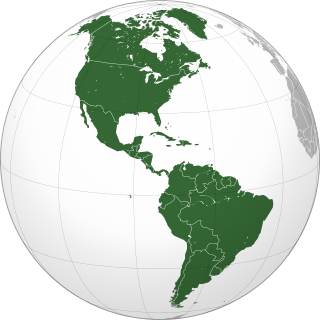 By geographical details, this place is thought to be present-day Newfoundland, and was probably the first European discovery of the American mainland, some five centuries before Christopher Columbus's arrival in the Antilles. Garðarr Svavarsson was a Norseman who briefly resided in Iceland, according to the Sagas. He is said to be the second Scandinavian to reach the island of Iceland after Naddod. He and his family appear in the Icelandic Sagas with the principal source from Haukr Erlendsson's edition of Landnámabók. Gunnbjörn Ulfsson, also Gunnbjörn Ulf-Krakuson, was a Norwegian settler in Iceland. 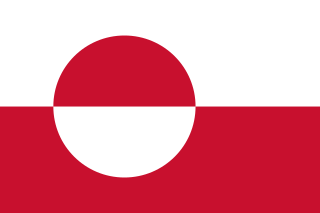 He was reportedly the first European to sight Greenland. A number of modern place names in Greenland commemorates Gunnbjörn, most notably Gunnbjørn Fjeld. The Western Settlement was a group of farms and communities established by Norsemen from Iceland around 985 in medieval Greenland. Despite its name, the Western Settlement was more north than west of its companion Eastern Settlement and was located at the head of the long Nuup Kangerlua fjord.